Do you live in a good country? Simon Anholt and his Good Country Index can help you find out. The index seeks to measure how nations and countries behave on the global stage, whether they speak the language of responsibility and sustainability – or that of competition and neglect. It is the first global ‘watchdog’ index of its kind. The Good Country Index is an ambitious and, in our view, very timely benchmarking project by Anholt, a professional known for his thinking, writing and consulting on country brands, competitiveness and national identity. 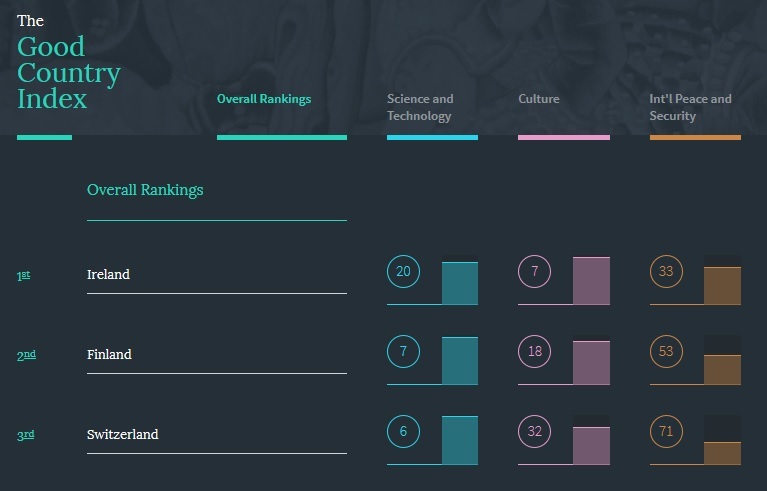 Together with Robert Govers, a well-known place branding scholar, author and advisor, Anholt has already created quite a stir among diplomacy circles for the somewhat surprising ranking results that saw Ireland heralded as the “goodest’ country of all (see our previous article on the Good Country Index). Despite much criticism and sensibilities, the project is taking shape. If this is the first time you hear about the Good Country Index, here’s the TED talk by Simon Anholt in Berlin, Germany. Further down you’ll find a summary of key points from a recent conversation between Anholt and Mexico’s Ambassador, Diego Pickering, published in The Diplomat. Diego: What made you start thinking of the Good Country Index? Because this is ground-breaking: it’s a very interesting proposal that contravenes everything we’ve heard of in the last few years. Simon: As I said in my TED talk in Berlin, my point of departure are the problems that we face in the world today. As a result of globalisation, almost all the serious problems we face are borderless ones. So it’s perfectly obvious that to tackle those problems – from climate change right down to children’s rights and landmines – we have to learn how to collaborate a lot more and compete a lot less. In this context the word ‘good’ means the opposite of ‘selfish’, not the opposite of ‘bad’. Simon: With the Good Country project, I have an ambitious but very specific purpose in mind: I want to change the culture of governance worldwide. Up till now, all of those governments have operated according to a simple mandate: their ultimate responsibility is to their own people, and their own territory. Governments – local, regional and national – need to understand that they are responsible for their own people and for the rest of humanity; they are responsible for their own territory, and for the rest of the planet. Of course the priorities will be ever-changing: in most cases, the priority of government will be its own people and its own slice of the planet, but the Dual Mandate means that never again will it be acceptable for humanity and the planet to be left out of the equation. Politicians are unlikely to accept this upgrade unless their people demand it of them, and that’s why I launched the Good Country Index. It’s basically an exercise in public diplomacy: it’s one of a series of initiatives I’ll be using over the coming years to encourage people to demand of their politicians that they recognize the existence of this Dual Mandate. D: It’s problematic for me to understand what the incentives are for people to be able to demand that Dual Mandate from their governments. This would be a 180-degree change in people’s mindsets from what they’ve always demanded: reforming the administration so that they can receive sufficient income, solving infrastructural issues, just giving an education to their children? S: I think this incompatibility between domestic and global affairs is a myth. At the very centre of the Good Country Index is a firm belief that even the most local of local issues, the most domestic of domestic challenges, can always be more effectively resolved by looking at them in the international context. At the most basic level, it’s about collaborating effectively with the international community to solve national problems, but there are many more advanced, more productive and more imaginative ways of engaging internationally, many of which have never been tried before. A: My own research, the Nation Brands Index, which I’ve been running since 2005 and has now collected more than 200 billion data points, shows pretty convincingly that the kinds of countries which people like best are the countries that engage most with the international community. There is a proportion of the world’s population that naturally advocates this idea. They are already very happy to say to their politicians, and perhaps already do, “We want to engage more internationally. We want to be a good country, we want to feel proud of where we come from, we want to be active contributors to the international community. We feel more comfortable not being selfish.” These are the people I want to speak to first: because they have an unmet need. 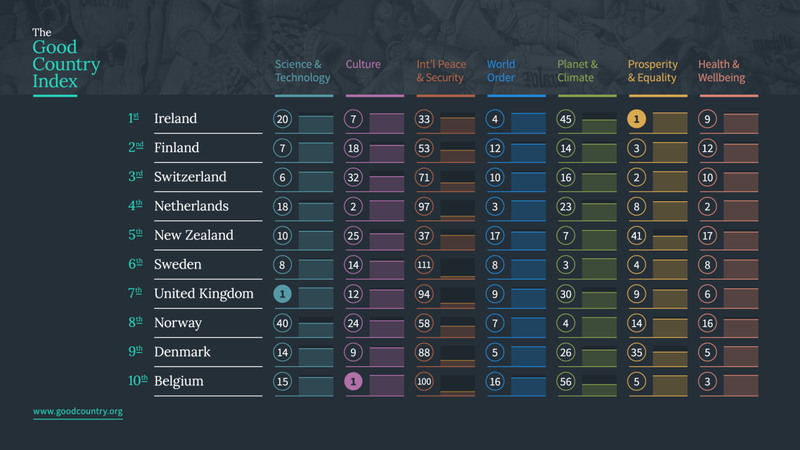 D: What indicators did you look at for the Good Country Index? S: There are 35 indicators in the Good Country Index, and the majority of these datasets come from the United Nations, the World Bank and other international agencies. To be included, these studies all had to satisfy a number of criteria. First of all, they had to cover all countries, although in the end we were only able to include 125 countries rather than all 196, simply because there are too many missing datasets in the remainder for me to be able to calculate a fair ranking for them (and this has caused a lot of annoyance to people living in the countries that aren’t included – they nearly all assume that the omission is deliberate on my part because I somehow don’t rank them as proper countries). Secondly, the databases have to coincide at a single point in time. It’s a very obvious point that still needs to be explained: this is not a historical overview. This is a single snapshot in time, and the year that we ended up with was 2010. This was the last moment at which all of those 35 databases were most recently refreshed. The data has to be robust and reliable, and finally it also has to be a true measurement of some impact that each country has outside its own borders. Here’s a list of books on place branding and nation branding by Simon Anholt and Robert Govers, authors of the Good Country Index. Enjoyed this interview with Simon Anholt on the Good Country Index? Spread the word!